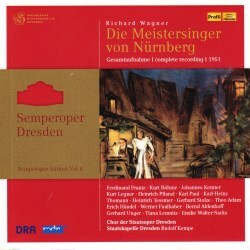 On April 9, 1950, the Semperoper Dresden staged its first Meistersinger since the war. This was a significant event for the company, which prided itself on its long association with the work: Dresden had been only the second house to present Meistersinger¸ in 1869, the year after the Munich premiere (and long before it reached Bayreuth). To commemorate the 1950 milestone, the company took the work into the studio the following year, making this recording for MDR. The tapes were archived at the Berlin Radio Research Centre, and have now been remastered for this release, Volume 6 of the Semperoper Edition, a commemorative venture undertaken by the Semperoper, MDR, and Profil. The CD remastering was carried out by Holger Siedler at the THS Studio in 2013, but no further information is given about the restoration process. The sound is excellent for its age, presumably through a combination of state-of-the-art recording, careful preservation, and some modern-day digital retouching. There is absolutely no tape noise or any other noticeable artifacts (my suspicious ear picked out what sounded like pre-echo in one of the quieter passages of act II, but I’m not going to swear to it). The recording, and perhaps the restoration too, focuses on the singers, bringing them impressive clarity and presence, while the orchestral tone is less distinct, although woodwind solos often jump out disconcertingly. The performance itself more than justifies the attentions of the restoration engineer. It finds Rudolf Kempe near the start of his career, during his 1949–51 tenure at Dresden, and a few years before his more renowned Wagnerian successes at Bavarian State Opera and Covent Garden. His communication with the performers here, especially the soloists, is exemplary, and the entire recording has the feeling of a closely knit company performance. The sense of drama is also palpable—it’s a recording that, first and foremost, tells the story through the music—perhaps a unique achievement for a studio recording of the work. The cast is excellent, another strong justification for setting the production down for posterity. The clarity of pronunciation from every soloist is exceptional, with every word crisply articulated. The male voices all sound deep for their respective Fach, a consequence perhaps of the restoration process, although these are undeniably big voices. Technically, there is little to fault in the singing, but stylistically some of the interpretations jar, at least with my modern tastes. Bernd Aldenhoff is an emotive Walther, but his liberal legato is wearying, especially in the Prize Song, where he continually slides around between the notes. As Eva, Tiana Lemnitz is more disciplined vocally, but her pronunciation is very plummy, with a curious inflection to all her vowels. The splendidly named Emilie Walter-Sacks was, no doubt, destined to appear in Meistersinger one day. Her Magdalene is a good balance for Lemnitz, with a similar vocal quality but a more direct delivery. Gerhard Unger is an excellent David, clear and bright, and convincingly youthful-sounding (he was 34 at the time). A few high notes tax him, but even then his tuning remains secure. As Sachs, Ferdinand Frantz is suitably commanding, but also nimble and intimate as required. His portrayal feels like a collaboration between singer and conductor, making the most of each of his set pieces, and while Kempe sometimes overindulges in the rallentandos, Frantz always has the vocal support to carry through. Heinrich Pflanzl is an articulate and emotive Beckmesser, though with little overt comedy in his characterization. And Kurt Böhme is an exceptionally deep Pogner, his voice weighty and imposing, bringing ideal authority to the role. Choir and orchestra exhibit the company’s impressive Wagnerian credentials, the tuttis and ensembles all delivered with class and with a tonal luster, readily apparent even from a 1951 recording. That said, the string sound lacks body and substance, though this is the only aspect of the early recording that significantly impinges on listening pleasure. But the technology cannot be blamed for some surprisingly scrappy ensemble in the brass, especially the horns, whose quiet ensemble entries in act II are poorly co-ordinated. Such minor technical issues apart, this is a satisfying Meistersinger, and a valuable document of its times. The substantial liner is big enough to be a libretto. It’s not; instead we are offered artist bios, a detailed essay about the history of Meistersinger in Dresden, right up to the present day, and many stills and sketches for set and costume designs from the production—conservative by today’s standards, of course, but useful context for this always engaging performance. This review appears in Fanfare magazine issue 40:4. I like this music and this musician too. Actually, all classic music has high vibrations which touch people's minds and souls. Music contributes to the continuous growth of emotions. This allows you to keep the listener in constant tension. Wagner had a great impact on European musical culture.